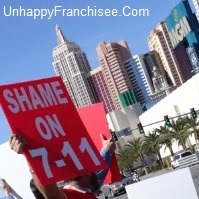 7-Eleven franchisee protesters who picketed the company’s “7-Eleven Experience” event have provided UnhappyFranchisee.Com with an update and photos from Las Vegas. 7-Eleven, Inc. franchisees are protesting alleged discriminatory practices and unfair franchise terminations. First updates from 2/14/15 are in red. Second updates from 2/14/15 are in dark green. (UnhappyFranchisee.Com) 7-Eleven, Inc. CEO Joe DePinto stated that the 2015 7-Eleven Experience at the MGM Grand is an event where franchisees can provide feedback and share what’s on their minds. 7-Eleven franchisees, many of whom are engaged in bitter litigation with the Japanese-owned franchisor, may have provided Joe with more feedback than he bargained for. A 7-Eleven franchisee insider provided us with and update (black type) and photos (below) from Las Vegas. We have inserted the NCASEF’s statements in red below. 7-Eleven National Board held a meeting in Pechanga California on Jan. 20th 2015. Franchisee Insider contends that Board Members Joe Galea, Jivtesh Gill, Serge Haitayan, Jas Dhillon, Maninder Walia, and Ken Patel (representing Hashim Syed) were in attendance. The National Franchisee board decided to hold a protest rally at 7-Eleven Experience in Las Vegas Nevada on February 11-2015. The National Franchisee Board also brought this information to the attention of 7-Eleven executive team and CEO Joe DePinto that they plan to hold a protest rally at the MGM Grand during the 7-Eleven Experience. Franchisee Insider states: “The Executive Officers decision to hold a protest was conveyed to 7-Eleven in a conference call. “Present at the Dallas meeting was Joe Galea, Chairman, Jivtesh Gill, Executive Vice Chairman, Serge Haitayan, Vice Chairman, Hashim Syed, Vice Chairman, Jas Dhillon, Vice Chairman, Maninder Walia, Treasurer. Yesterday, February 10th, more than three hundred 7-Eleven franchisees came together to participate in a discussion to express their concerns over recent discoveries of certifications by 7-Eleven employees that have become public. Franchisee concerns of 7-Eleven management as to churning of their stores and discrimination. The franchisees also discussed latest news items of discrimination towards South Asian franchisees by 7-Eleven management. Andy Khan and Karamjeet Sodhi discussed with the group how they were not allowed to attend the 7-Eleven Experience 2015, even though their franchisee contract says 7-Eleven will provide ongoing training to operate their 7-Eleven franchises and other 7-Eleven franchisees who had not registered for the Experience and it’s workshops or failed to register were allowed to attend. It was a deliberate act by the CEO Joe DePinto to keep Andy Khan and Karmajeet Sodhi out of the 7-Eleven Experience to make an example for other franchisees that they could be subjected to the same isolation if they make any moves not approved by 7-Eleven or the CEO of 7-Eleven. The franchisees also distributed hundreds of t-shirts with slogans showing their concerns to wear and take back to their stores for employees to wear to spread the message nation wide as to 7-Eleven taking away their profits and livelihood. As Joe DePinto spoke on February 11th addressing the franchisees and 7-Eleven employees, many franchisee wore red color t-shirts with slogans expressing and voicing their concerns as they attended the event. 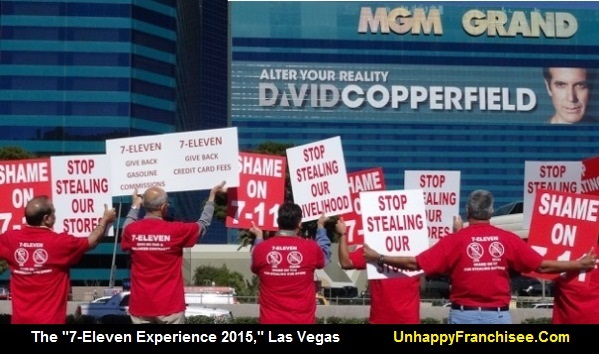 A large number of 7-Eleven franchisees stood outside MGM Casino protesting. The 7-Eleven franchisees have started a no confidence petition in Joe DePinto to lead 7-Eleven as CEO of 7-Eleven. Today, February 11th 7-Eleven franchisees and families could be seen in various casinos wearing their red t-shirts expressing their views. 7-Eleven franchisees are determined to alter their reality that 7-Eleven is seizing their stores with little warning and no compensation, as charged in multiple lawsuits. Chief among franchisee concerns is whether 7-Eleven, Inc. is discriminating against South Asian franchise owners and illegally seizing great numbers of their stores to resell for profit and/or internal political reasons. we heard about the protest inside MGM as joe spoke and did his horse and pony show. My hat off to the brave who got out as most franchisee’s inside were on their cell phones. The protest was a joke in Vegas….I saw more FZ in the trade show than protesting….that’s why FZ are not taking seriously…they don’t even support one another and now we own your own FOA…why are FZ complaining about anything……when its in the contact they signed….its not our fault you didnt read it…..we should take back more stores…..
For last 10 years my stores inventory ran on average between 55k to 60k. 7-Eleven came out with this scam that the sales are not growing because of poor assortment of products in the store. So my fc ordered more stuff and raised my inventory over 100k. That is almost doubling my inventory . All the new products seven elven introduced it makes profit on it by buying it cheaper and selling it at profit to the stores in collusion with McLane . By selling that product at higher than average cost 711 generated it’s first tier profit . Now that merchandise if it does not sell will sit on shelves for days. You pay interest on that merchandise. That interest income is second tier profit for 711. Whatever new merchandise you are able to sell to customers that profit is again shared by 711generating third tier profit . At the end of few months whatever merchandise don’t sell and goes bad you write them off thinking that 7 11 will share the cost but you don’t know what they actually paid for it to begin with. Any ways you write off bad merchandise and higher write offs drag your gross profit down and reduce your take home saving more money to 711. Tha is fourth tier of profit you just made for 711. Looking at big picture you wonder who is in the business of making money without lifting a finger ???????? At someone’s expense .trust me that someone else is just you not neighboring circle k . They got you at the right spot….. by the balls..and there is no good night kiss at the end.